LearnLab at Carnegie Mellon and the University of Pittsburgh has an exciting summer research opportunity available to undergraduate students. This research program encourages applications from students who would like to conduct research in the fields of psychology, education, computer science, human-computer interfaces and language technologies. This program seeks broad participation, including members of underrepresented groups as defined by the National Science Foundation (African American, Hispanic, Native American) who may be considering pursuing further graduate study in the learning sciences. LearnLab’s REU program allows talented undergraduates to spend 8 weeks during the summer in a research laboratory at Carnegie Mellon University, the University of Pittsburgh, or one of our research partners. The REU program aims to make LearnLab’s programs more visible to students not traditionally exposed to our fields. The REU program supports LearnLab’s commitment to training a diverse set of science, technology, education, and psychology leaders. Applications are encouraged from students who wish to learn to conduct research in a modern academic research laboratory under the guidance of experienced scientists and engineers and experiment in real classroom environments. The REU program will expose students to the excitement and opportunities of a research career. This experience will provide excellent preparation for students interested in subsequently pursuing a Masters or Ph.D. degree. 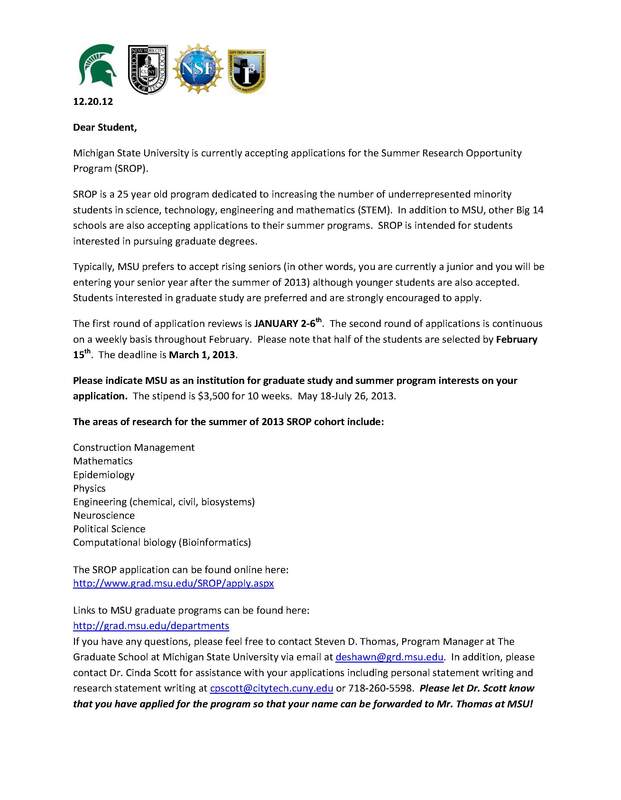 Although students from other years may apply, this opportunity is most fitting for a student at the end of the junior year of undergraduate studies. Each student will receive a fellowship stipend of $4000 for the eight-week REU program. Food, housing and travel will also be provided. Students will conduct research in an area matched to the interests expressed in the student’s application. Guidance and supervision of the research project will be provided by the faculty member as well as, in some cases, a postdoctoral fellow and/or advanced graduate student. Seminars specific to those participating in the REU program will be held weekly including seminars on graduate admissions and career opportunities in science, education, computer science and engineering. In addition, LearnLab seminars and those held by Carnegie Mellon’s Human Computer Interaction Institute and Language Technologies Institute and seminars at Pitt’s Language Research and Development Center will be open to the students, giving them exposure to a wide range of research in learning sciences. REU Program Benefits: There are several benefits that the participating students may receive. If the student’s research in the summer is of high quality and has added value to an ongoing research project, past students have been asked to be a coauthor on the research team’s publication on that subject. Addition of publications to the resume of a graduate school applicant always greatly improves the application. If the quality of the research is high, the faculty member who advised the student would likely be willing to write a letter of recommendation for the student which could be included in a graduate school application. Research experience in one of the National Science Foundation’s premier research centers will be viewed attractively. Scholarships may be available for graduate research on projects in LearnLab. The student should inquire about these possibilities during the summer. 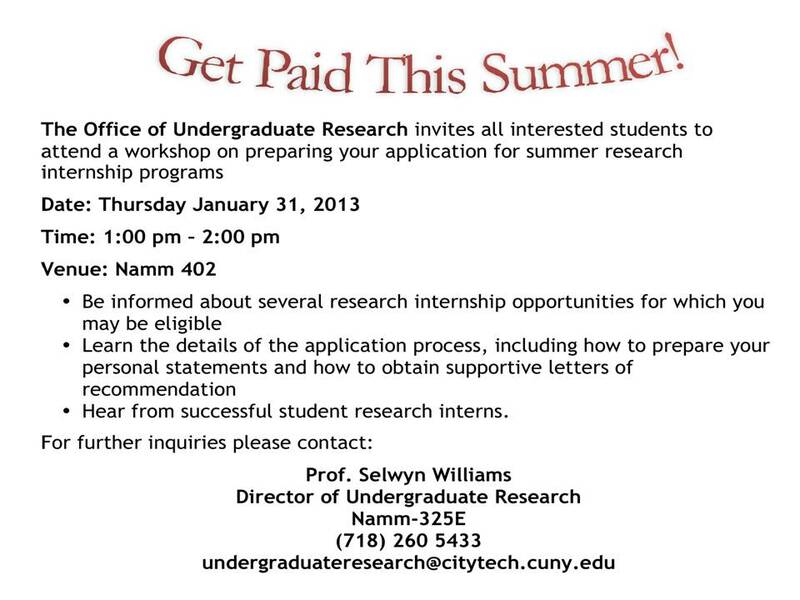 REU Program Dates: Students will begin their research experience on Sunday, June 2, 2013 with a welcoming reception and information session. The REU program will end on Friday July 26, 2013 with a poster session in the afternoon.. Submission of an application indicates that the applicant agrees to be present from June 2 to 4pm, July 26, 2013 inclusive. Application Deadline: Deadline for applications is February 15, 2013. Students will be informed of our decision by March 1, 2013. Minimum Requirements: Students should have a minimum of 3.5 GPA out of 4.0 although we will consider students who show by other measures that they are exceptional and who have GPAs over 3.2. Class standing and grades in specific subjects that are close to the field of research will also be considered, as are recommendations. 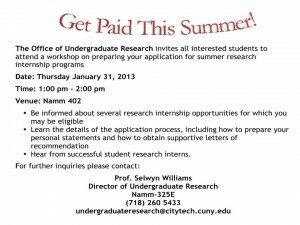 Applications are now available for the summer 2013 REU program in nanotechnology at the University of Massachusetts Amherst is now accepting applications. For undergraduate students planning for a career in cutting edge research, the Summer Undergraduate Research Experience (SURE) Program in Nanotechnology at UMass might be for you. The ten week lab-and-learning experience will give you a head start on a field that is truly at the forefront of knowledge–nanotechnology! Women and underrepresented minority students are strongly encouraged to apply. Eligibility is limited to U.S. citizens and permanent residents. Undergraduate majors in Chemical Engineering, Chemistry, Electrical & Computer Engineering, Mechanical & Industrial Engineering, Physics, and Polymer Science & Engineering are recommended for the program. Click below to read about this great opportunity!